Anne Perry’s Christmas novels are comfort food for the reader who wants a short mystery novel with a holiday theme. 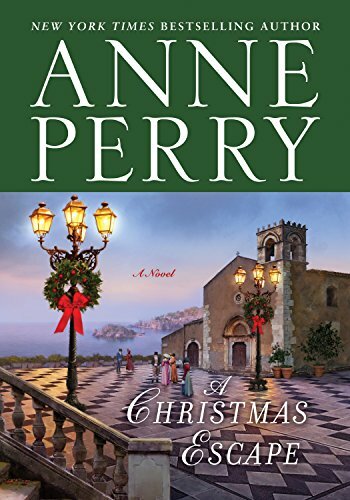 As enjoyable as a cup of rum-laced eggnog and a slice of gingerbread, A Christmas Escape, number 13 in Ms. Perry’s yuletide series, takes the reader to the Mediterranean island of Stromboli where a group of British tourists plan to spend the holiday. He is greeted by Stefano, owner of the small hotel nestled at the foot of the island’s volcano. “It’s rattling and making noise most of the time. . . . Don’t worry, lava doesn’t come this way. Just rocks now and again.” This is a discomforting description of Stromboli’s volcano, but Charles supposes that if Stefano isn’t unduly worried, then he shouldn’t be, either. After lunch, as Charles walks back to him room, he overhears what is apparently an ongoing argument between Bailey and his wife about his intention to sell her childhood home. As the husband controls both his wife’s money and property during this period before The Married Woman’s Property Act was passed in Parliament, Isha Bailey has no recourse. Bailey can do as he pleases, and it pleases him to sell his wife’s home. Not only do the Baileys argue about the sale of Isha’s property, but also about Quinn. “What on earth makes you defend a pompous, self-important fraud like Quinn?” Isha retorts that Bailey is jealous, and the argument ends in a slammed door and the sound of a woman crying. Charles feels helpless because there is nothing he can do, but Bailey has the law on his side. And what is the basis for his hatred of Quinn? Colonel Bretherton happens by and tries to comfort Isha, but like Charles there is nothing he can do. He ends the conversation by warning her not to climb the volcano by herself. Charles remembers that Stefano has also warned everyone against climbing the volcano alone. The hotel owner has also issued warnings. The mountain is sleeping, not dead, Stefano has reminded each guest. Perry uses the volcano as it rumbles to a smoky, ash-filled life as a symbol for the festering ill will that Bailey brings to the Christmas guests. As the volcano finally rouses itself to erupt, flinging stones and red-hot lava down on the hotel, Charles and Roger Finbar find Bailey under a fallen timber. But it is not blunt force trauma that ends Bailey’s life, it is a slit throat. The question is who left the shelter of the basement during the early minutes of the eruption to track down and murder Walker Bailey? Falling stones flung down on the hotel by the erupting volcano kill both Stefano and Roger Finbar, leaving the rest of the guests to down the mountain toward the village and the sea. Charles finds himself both the guardian of Candace and the leader of the tiny band of remaining guests, not a position for which he feels fit. He has always felt himself a failure; how can he succeed in leading anyone to safety? A Christmas Escape is a delightful cozy with its charming characters that mirror 19th century manners and attitudes. Perry’s brief descriptions of her characters are artistic in a way many authors fail to achieve. A few verbal brush strokes delineate each guest without the excruciating detail that would needlessly slow the narrative. In a novel of less than 200 pages, details must be brief, vivid, and meaningful. A Christmas Escape will please fans of historical cozies, but is not recommended for those who enjoy noir. There is murder in this Christmas story, but very little blood.